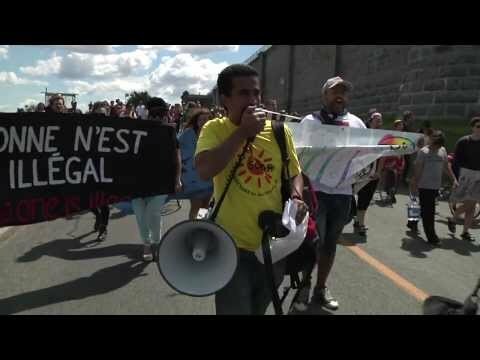 On August 11, 2013, around 100 migrants and their supporters descended on the Laval immigration detention centre just outside of Montreal, to denounce the Canadian government's practice of locking up and deporting non-status people. The demonstration was held in conjunction with Prisoner Justice Day, which is marked every year on August 10 to commemorate the lives of those who struggle and die behind bars, and to reaffirm people's commitment to abolishing jails. Some people came by bus, and others came on bike, and when they arrived, they were determined to make enough noise so that migrants inside the detention centre could hear their message. On any given day, 400 to 500 migrants are confined behind the walls of detention centres across the country. The past decade has witnessed a significant increase in the number of migrants detained, with 82,000 detained from 2004 to 2011 and an additional 13,000 detained since 2011. Following the implementation of mandatory detention policies through Bill C-31, all those entering by so-called `irregular means` may face up to one year in detention. fence. Messages of solidarity in Arabic, Hungarian, Spanish, Urdu, English, and French were read aloud, while remnants of clothing were strung along the length of the wall, symbolizing the violence experienced at border crossings around the world. During the picnic, someone on the inside informed the organizers that, because of the demonstration, visiting hours had been cancelled all day, prisoners were being punished by having prayer time revoked, being prohibited from smoking, and being confined to their rooms. Enraged by this news, people rushed back to the outer fence of the detention centre and began banging on its metal gates. Soon after, the gate was torn down and a group of protestors breached the perimeter and managed to take their rage directly outside the buildings where migrants are caged. In the end, no arrests were made. While the act of tearing down the wall was symbolic, it was still one step towards taking down all prison walls and borders that separate people throughout the world. Trusted by 2 other users.